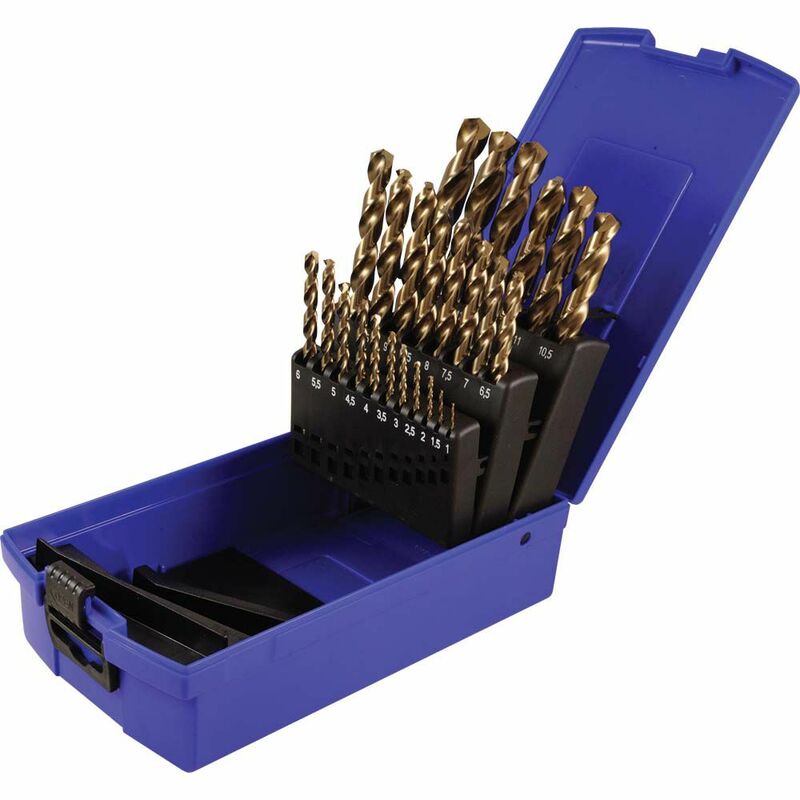 The drill bits in this 25 piece metric set are made of M35 steel and packaged in a durable blow mould case. Made in Spain. Jobber length 135 degree split point. This comprehensive Mechanics Tool Set from Husky includes a generous arsenal of sockets, wrenches and bit sockets to complete nearly any fastening task big or small. Each instrument's measured capacity is deeply engraved into its body, providing wear resistance for years of easy readability. A corresponding compartment for each tool is molded into the plastic storage case, making it easy to identify and transport each of the 185 pieces in this set. These durable tools are forged from chromium-vanadium steel designed to stand up to the rigors of frequent use and are coated with a protective finish that wipes clean easily and inhibits corrosion. The 100 different standard and deep sockets along with the 15 combination wrenches and 19 bit sockets allow you to tackle any fastening or repair project. This is the perfect portable set for both professional and DIY mechanics to get the job done. Use these Kreg pocket-hole screws to complete a variety of wood joinery tasks. It includes 5 types of common fasteners used to join pieces of wood 1/2-inch to 1-1/2-inch thick after drilling holes with a separately sold jig. A handy storage case with individually labelled compartments for each fastener type is included along with instructions for the proper application and wood thickness. 25 Piece Metric Colbalt High-Speed Drill Bit Set The drill bits in this 25 piece metric set are made of M35 steel and packaged in a durable blow mould case. Made in Spain.